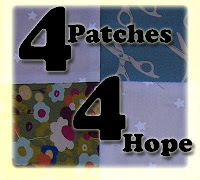 4Patches4Hope began as a desire to use my passion for quilting, and the power of social media and word of mouth, to create quilts to comfort those undergoing cancer treatments and at the same time raise money for cancer research. The original timeline was to begin on Valentine’s Day, 2011 and culminate on my mother’s birthday –today - October 4, 2011. For one reason or another, I did not get the ball rolling and start to get the word out about the project, so then I revised my start date to START on Mom’s birthday. Unfortunately Mom’s cancer had a different timetable, and on July 12, 2011 her battle with this disease ended. As I worked through the emotions that came after - I decided to forge forward with this project - as there are mothers, sisters, aunts, cousins, daughters, nieces, friends and more who could benefit. The concept is simple - Make a 4 Patch... Make a Donation... Make a difference. 1. Make light-dark 4 patch block(s) using 2 1/2” squares (blocks should finish at 4 1/2” square). 4. The goal is 1000 blocks and $4,000 by February 28, 2012. 5. Received blocks will be assembled into “comfort quilts” and donated to the Anderson Medical Center in Anderson, SC and the Pluta Cancer Center in Rochester, NY. 7. Donations of backing fabrics, batting and services are also appreciated. ...Share the dream of a cure.